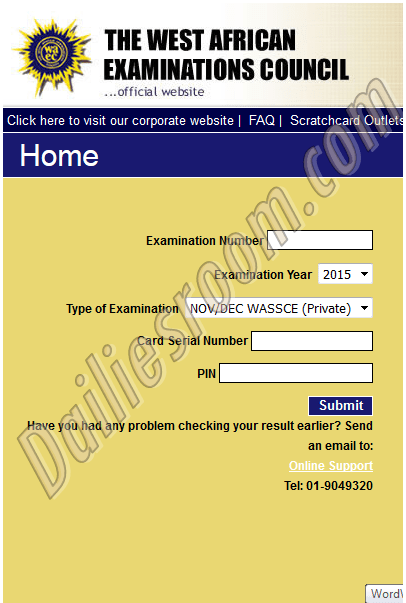 Enter your WAEC GCE Examination Number. Select the Type of Examination as shown in the image above. Enter the Personal Identification Number (PIN) on your Scratch card. Go on submit button and get their result. Candidates must sure that he/she prints out a copy of their result for further use. Congratulation if you have follow the process that was showed above. Because with this you can now check your result with out any one showing how to do that. So please when ever you want check WAEC GCE Result for 2015 and more year always makes sure you follow this steps that is showed to you. Please also Note that you can Stay Tuned and Bookmark DailiesRoom.com in your browser for more Tips and Tricks. And if you have any doubts or contribution to make about the 2015 WAEC GCE Result Checker Process, just Feel Free to use the Comment Box below. We will get back to you as soon as possible. THANKS & Best of Luck!! !